Home » KYRGYZSTAN » Ala Kul Lake – trekking plan with MAPS! Lake is not so big, has surface of 9.46 km2 (length 2.3 km, width 0.7 km). During trekking preparation we had quite big problem to find reliable and detailed trail description. Information found in internet and guidebooks were very general or incomplete. We took a map, marked what we have, what we didn’t have we checked at place, in Kyrgyzstan. Below, summary of our trekking, two options of Ala-Kol trekking, longer and shorter with marked maps we used. We hope it will be useful when you’ll plan your trekking? From the Valley of Flowers go further along the river Jeti-Oguz, after 3 hours of trekking you’ll reach the place where Jeti-Oguz river combines with mountain brooks called Teleti. Then you have to change direction and follow upstream of Teleti brook, turning left, uphill. Your trekking day slowly is going to end so consider to stay at place for the night before pass peak attack next day. The area is in the forest (you can pitch your tent, light the campfire) with water access (Teleti brook). Approximately 40 minutes uphill there is a local yurt, you can ask about source of water or just observe local life. Today you will reach Teleti Pass located 3800 m above the sea level. That is important to start this day early in the morning to arrive at camping place before sunset. The trail at the pass is long but easy and very impressive. First, you will go shortly via forest and later via the valley, all the time along the Teleti brook. Flat trail in the valley will make you crazy… view of four-thousandths peaks everywhere around. Be carefull and don’t stumble! After 4 hours of relaxing trekking you will be at place where hill begins. You will not overlook that place. Old, rusty signboard tells you to turn left and face up the mountain It will take app. 4 hours to put your feet at the top of pass, depending on your walking, speed. To overcome you have height difference of 800 meters, so it can be tiring, especially at this altitude. Tiredness definitely compensate views of the snow-capped, monumental peaks. When you descend the pass, think about accommodation. After few hundred meters green fields start, you can pitch your tent there (near the brook Kel-Ter). All day long descent to Karakol River Valley. The trail from your accommodation place under the pass is app. 7 h, first you are going all the way down, along the brook Kel-Ter up to the point where it join to the river Karakol. The footpath to the top leads through clearings, fields overgrown small plants and finally steep slope through the forest to the river Karakol. Then the road becomes flat up to Karakol Base Camp, where you can regenerate, and even take a dip in the traditional bath. You can even buy there a can of Coca-Cola, of course overpriced, but please believe me, it will taste amazing, like never before! There you will spend the last night before climbing to the lake Ala-Kol. 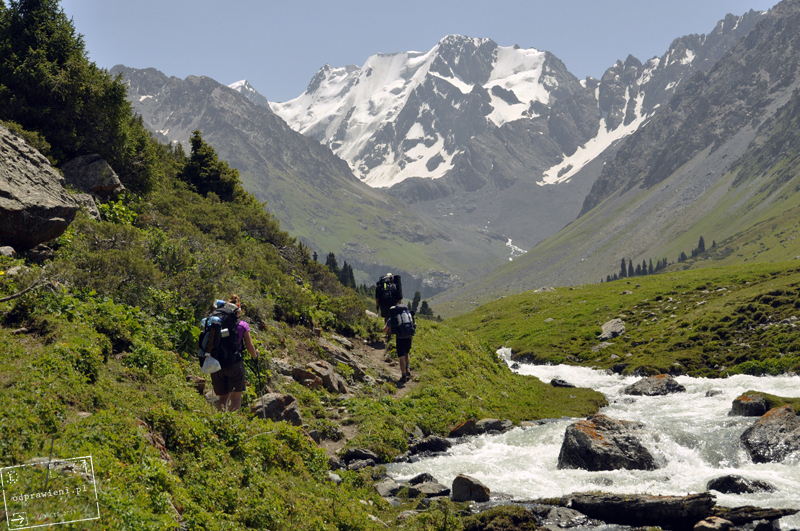 Karakol Base Camp is located in the National Park of Karakol, where the following fees apply for tourists: Entrance – 250 som per person, 150 som for a tent. There is no official place where you can pay, but the park guard will surely find you, and if he doesn’t, it’s his loss. Today your goal is finally see Ala-Kol Lake. Look around and try to locate old, wooden and dangerous bridge above the mountain river Karakol. Yes, you have to pass this bridge – that is beginning of your trail today. The trail is varied, initially quite steep (trekking through the forest, app. 2h). Then climbing the rocks, not very steep but technically more difficult. Your light at the end of the tunnel will be wooden hut just before final hill to the lake. You can prepare some food there, take a sit and look on the mountain or even spend a night if necessary. From the hut you have just 3 hours of climbing up. The sign you are really close to the lake, which you don’t normally see, is waterfall. Next to waterfall is last, really last climb. Rocky, steep and tiring…taken into account you spent whole day for climbing up. Here you are! You are at place, on the lake! Now consider where do you want to pitch your tent, because in our opinion night at lake is mandatory! There are two options, do it right here at the western shore. Why not? View is beautiful, probably sunset is soon. What else do you need? If you have limited time, pitch your tent on the other, eastern shore of the lake. Way there will take 2 hours (along the lake) what means two hours less tomorrow. Let’s assume that you stayed at night at western shore, because you couldn’t refuse to admire upcoming sunset. After 2 hours of trekking along the lake you will be at place where you see the highest pass of that trekking, Ala-Ker Pass 3860 m above the sea level. To climb on the pass is not so difficult. Problem starts when you go down. Distance is short but slippery rocks falling down with every your step, sometimes even rock avalanches or snow makes this section of the trail challenging – be careful. Later is only easier, trail leads down, initially along the brook, between the mountains… long, but impressive. Here you have a choice, you can stay at night there and extend your trekking up to 6 days or go down directly to Altyn Arashan village, where you can rent a room in guest house. This way takes 5 hours so you will be there at the evening, after sunset for sure. If you don’t have enough time for 5 or 6 days trekking you can make it shorter and do it in 3 or 4 days as maximum. Then you need to start at Karakol Base Camp, spend night there to get acclimatized. Next day you start and follow with instruction described above, in 5/6 days option. 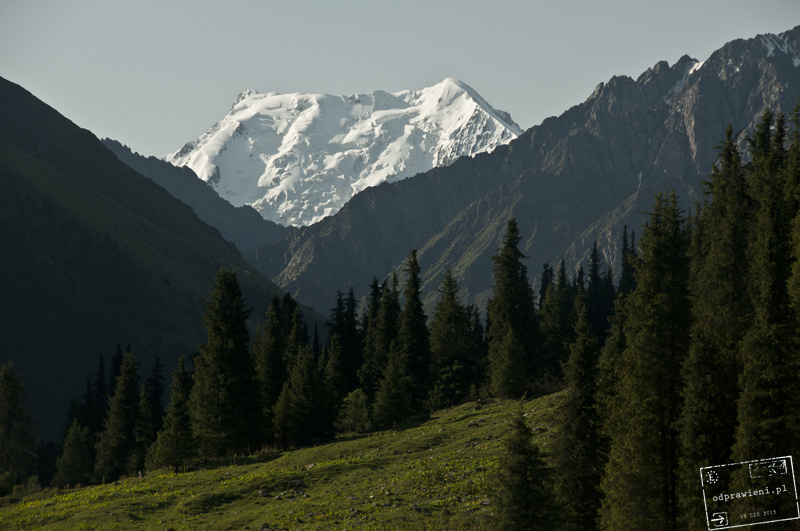 Ask about transport to Karakol Base Camp in the city of Karakol. That is national park, there is no entrance for each car for sure. 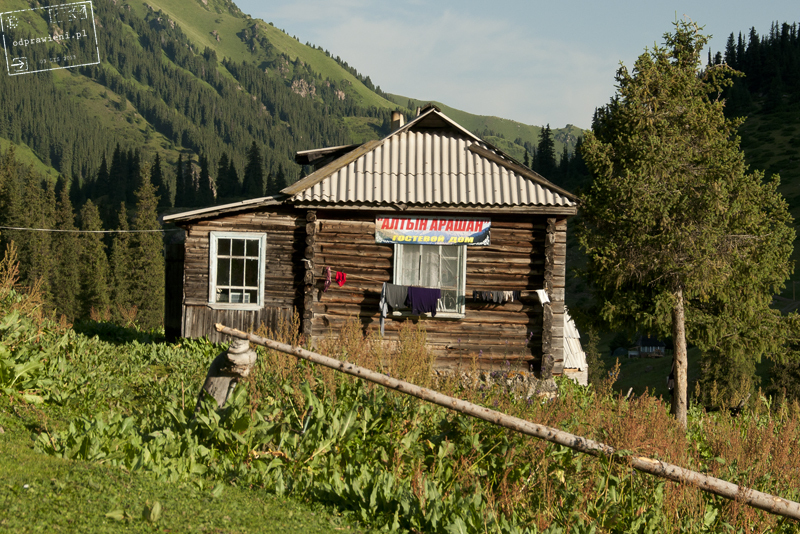 Altyn Arashan that is really small mountain village where you’ll find few accommodation possibilities. Village is famous due to hot springs existing in the ground there. Each guest house has own tradictional bath, perfect for relax after days of trekking. Village has great location to admire view of the one of the famous peak of Kyrgyzstan – Palatka Peak 4260 m above the sea level (has shape of old tent). Located in the old house, where local family offer simple rooms with food service. Prices: 200 som/ night per person, bath 200 som per person, dinner 200 som/person, breakfast 150 som/person. Guesthouse owner can support you and organize transport to the closest village, Aksu (300 som per person). Important, ask about transport schedule as soon as you come there. Old soviet jeep has just one tour from/to Aksu per day. same here : thanks for the interesting trip description. I was wondering at what time of year did you do it? We plan being there beginning/mid september, could it be too much snow without “glacier equipment”? We’ve been there in August so it was high summer period, almost no snow ver 4000 m. I think in September can be little bit harder and “glacier equipment can be useful, just safety.